Best of Both Worlds? 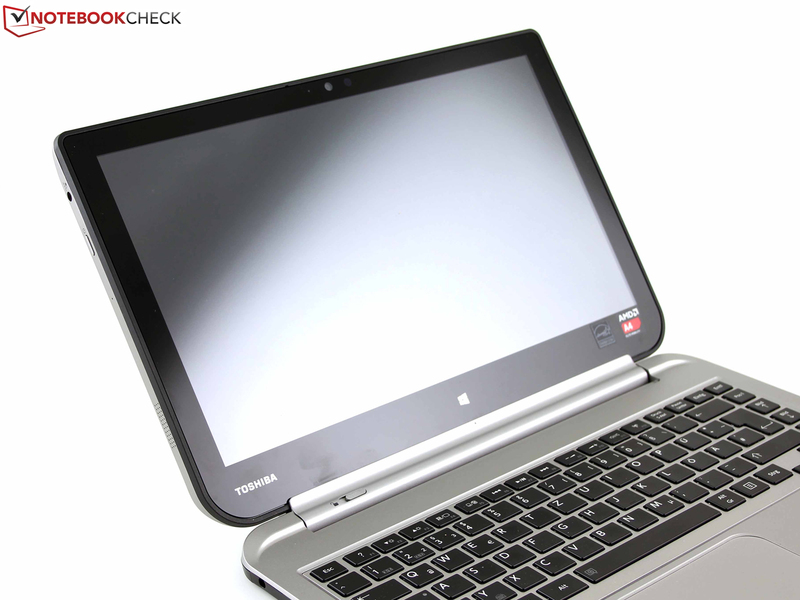 Toshiba is promising a "High-performance Tablet" and a "Fully-equipped Notebook" - all in one device. Is that possible with a standard HDD and AMDs weakest APU? 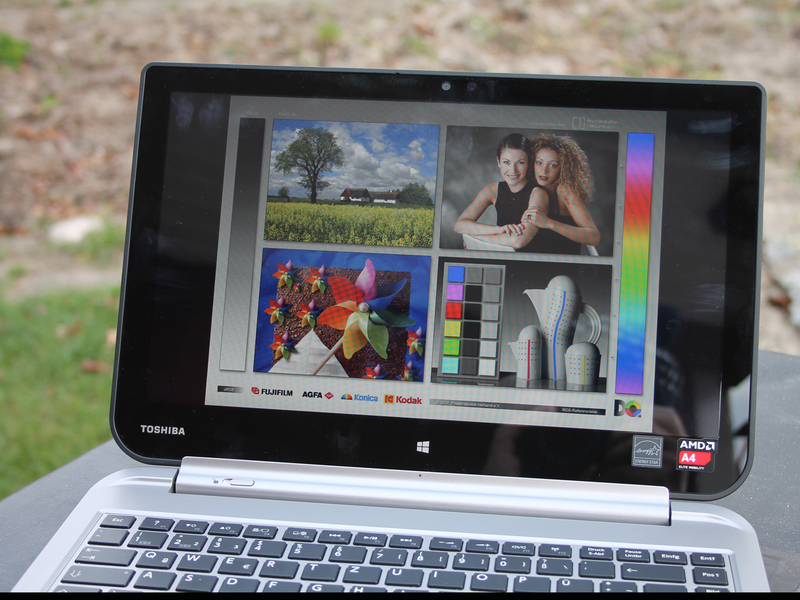 Toshiba Satellite W30Dt-A-100: is it truly as seamless an integration of notebook and tablet, as the manufacturer claims it to be? Android tablets are sold far more than their Windows counterparts are, although Windows is still the primary OS used at home or in the office. So why is it like this? Well if we are talking about quantity, we should also consider pricing: buyers can purchase a fully functional Android device for Christmas for a mere 100 to 300 Euros (~$137 to $410). The switch from a conventional Windows PC to a Windows tablet is hard for customers because the differences are far too great. We were just navigating with buttons and now we only have a touchscreen? The transition is far too fast and, as such, at least for now, manufacturers have to keep to good old laptop format and not in tiny 10 or 11.6-inch formats, but in larger, far more standard 13.3-inch scale. Toshiba presents their solution to the problem: the Satellite W30Dt-A-100, a 13-inch tablet with a keyboard dock. As most buyers would laugh at a storage capacity of 64 or 128 GB, the manufacturer has gone the extra mile and provided a 500 GB HDD. Price of the W30Dt: 670 Euros (~$916; market price). This market niche for 13-inch convertibles below 1,000 Euros (~$1367) was held by HP with their Split x2 13-m115sg (Core i5-4202Y, less than 900 Euros; ~$1230). For more money, Asus offers the Transformer Book TX300CA with keyboard dock (Core i5 version, starting at 1,100 Euros; ~$1503) and HP brings the Spectre 13 x2 Pro + keyboard dock (Core i3 version, starting at 1,100 Euros). Sadly, both models are in a completely different price category. 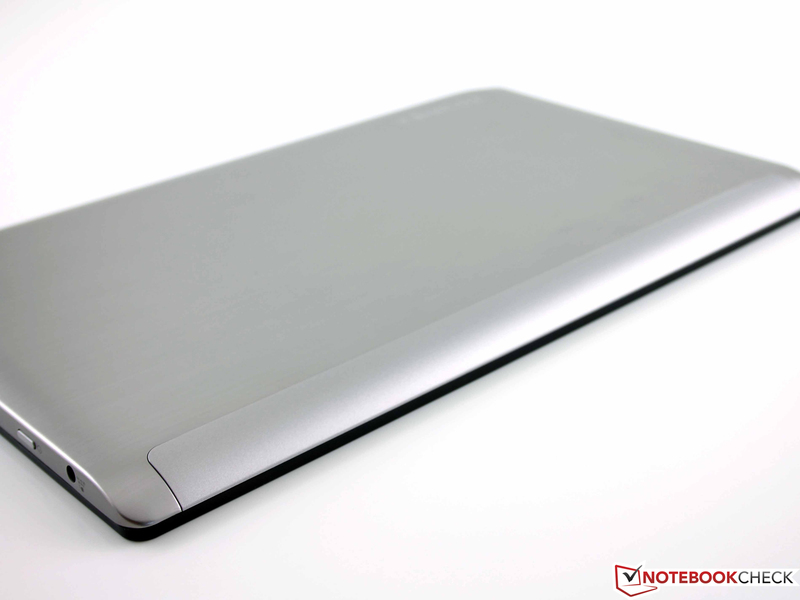 As such, we are taking the Transformer Book T100TA as the second comparison model (10 inches). This small convertible should be available shortly with a 500 GB HDD in the keyboard dock (480 Euros; ~$656, not yet available in Germany). Two strong metal hooks keep the tablet connected. 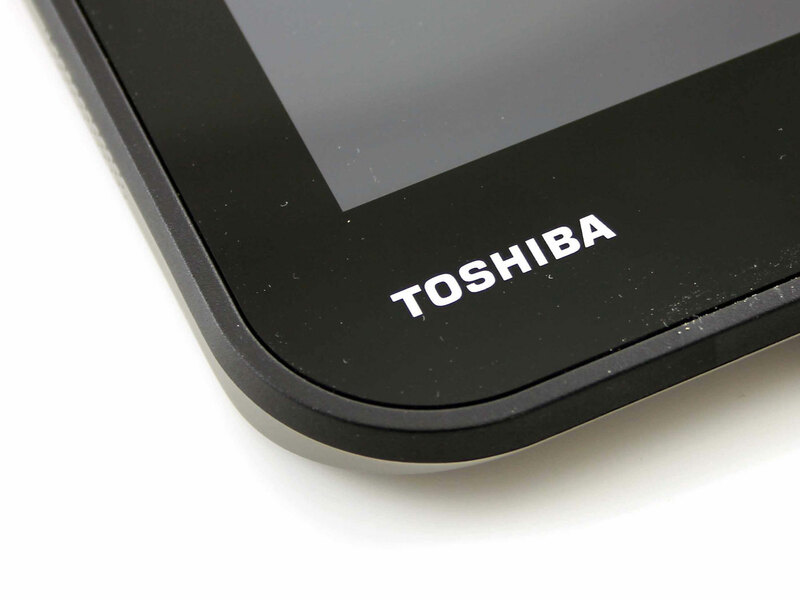 Toshiba has picked a heavy build: 2,164 grams (tablet + dock; ~4.8 pounds). The tablet alone weighs 1,028 grams (~2.3 pounds). Typical 10 or 11.6-inch tablets (Windows) are much lighter and the 13-inch competitor, the HP Split x2, weighs slightly more at 2.3 kilograms (~5.1 pounds). The tablet is a thick model at 13 mm (~0.5 inches), but a hard rubber band around the panel allows it to be held securely in the hand. Furthermore, this rubber border keeps the tablet elevated when placed face down, preventing the screen from being scratched. 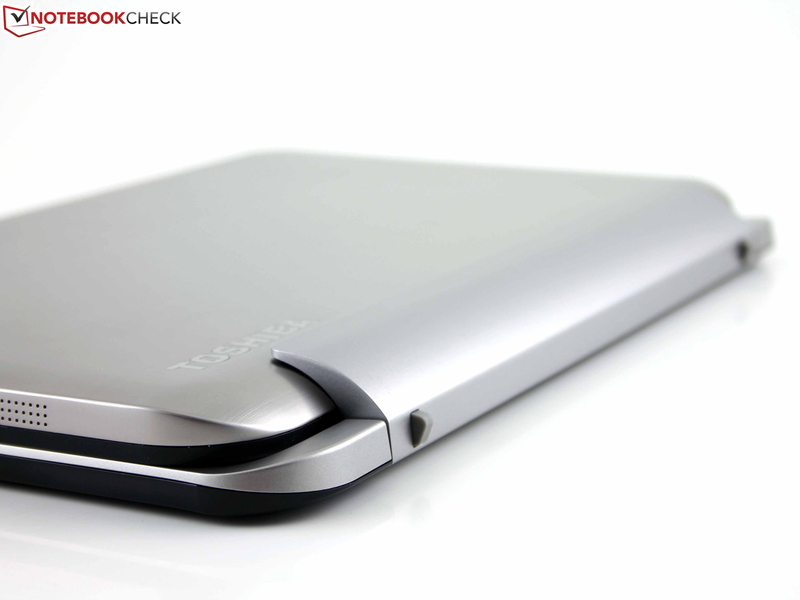 The back of the tablet is made of brushed aluminum that feels nice and cool in the hands. 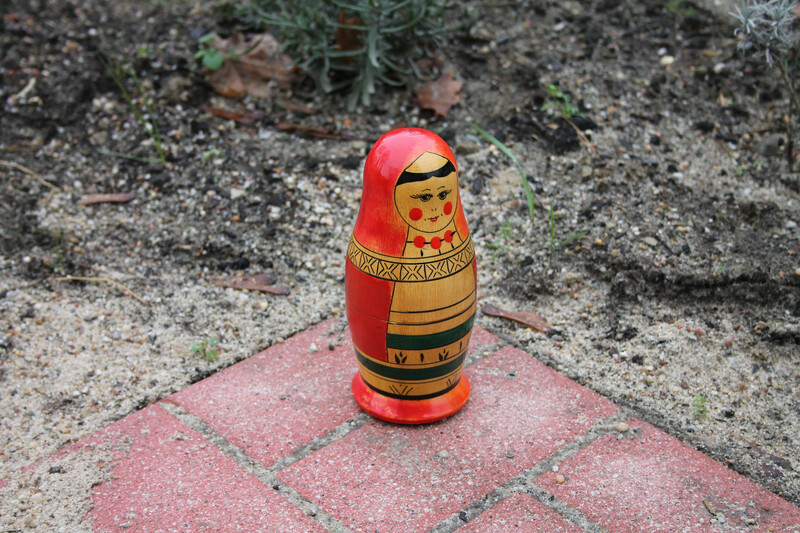 The model is sturdy and the gaps between the materials are even. 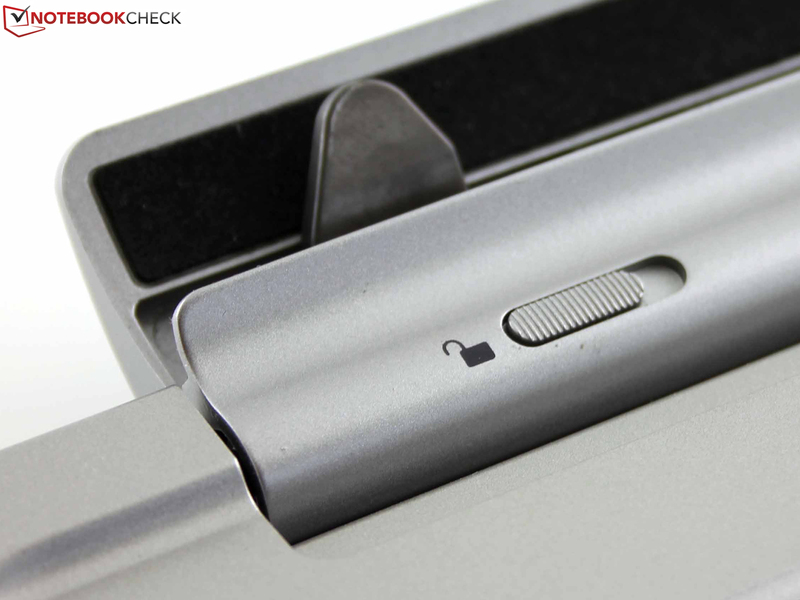 A thick metal hinge secures the tablet in place when docked with two sturdy hooks. The build quality is good, promising longevity. Sadly, despite all this, the tablet still wobbles when docked. Thankfully, this does not affect the interaction with the model. As the base is a heavy one kilo as well (~2.2 pounds; contains a second battery), the heavy tablet (when docked) cannot topple the model over. The W30Dt is a reliable unit as a laptop on the table, but once picked up, it becomes clear that there are two separate parts. The base is made entirely of synthetic material and has a resistant, silver surface. However, it has some weak spots: picking up the W30Dt at one of the front edges will depress the material due to the weight of the tablet. Despite its thickness, the tablet only offers miniature ports, such as micro HDMI or micro USB type A. A converter cable is included in the delivery for the latter, which provides the USB type A (female) as well as micro USB type B (male). The positioning of the ports at the front of the right side is a poor choice during laptop use. A universal USB 3.0 dock offers some relief and can be purchased from Toshiba (Dynadock). With this, all peripherals, including external TFTs, can be connected via a cable to the test model. The USB 3.0 port is thankfully placed on the docking keyboard. We also like that both the tablet and the dock have a power outlet where the power adapter can be plugged in. The WLAN module originating from Atheros Communications (AR9565) offers relatively weak signal strength. At a distance of 10 meters (~33 feet; through wood walls), the device only recorded three bars (reception). Outside, at 15 meters away (~49 feet), we only had 2 bars. 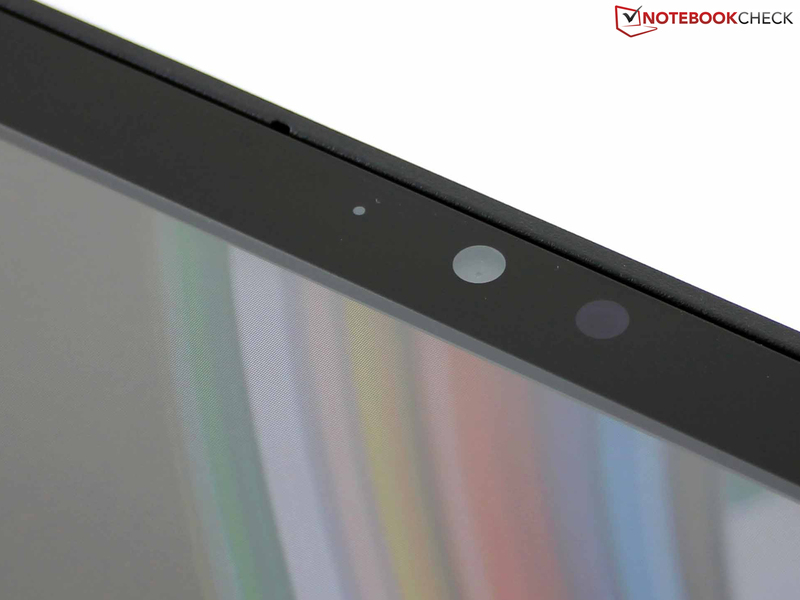 The aluminum back of the tablet does not prevent the antennas from getting a good reception, as they are installed in the broad, silver synthetic material strips of the tablet. Bluetooth 4.0 is included alongside a relatively new feature offered by the WLAN card: Miracast (Wi-Fi CERTIFIED Miracast). The screencast standard is supported by Windows 8.1. This feature allows the transmission of picture between two devices, for example to a TV or a Smartphone. Similarly, certified devices have been released since 2013: for example, Google Nexus 4, LG Optimus G or Samsung Galaxy S III. AirPlay (Apple) and Wireless Display (WiDi, Intel) are the proprietary competitors of this technology. The HD webcam on the front is suitable for snapshots. It focuses well during daylight, but details are washed out. The HD front camera alongside the microphone and ambient light sensor. 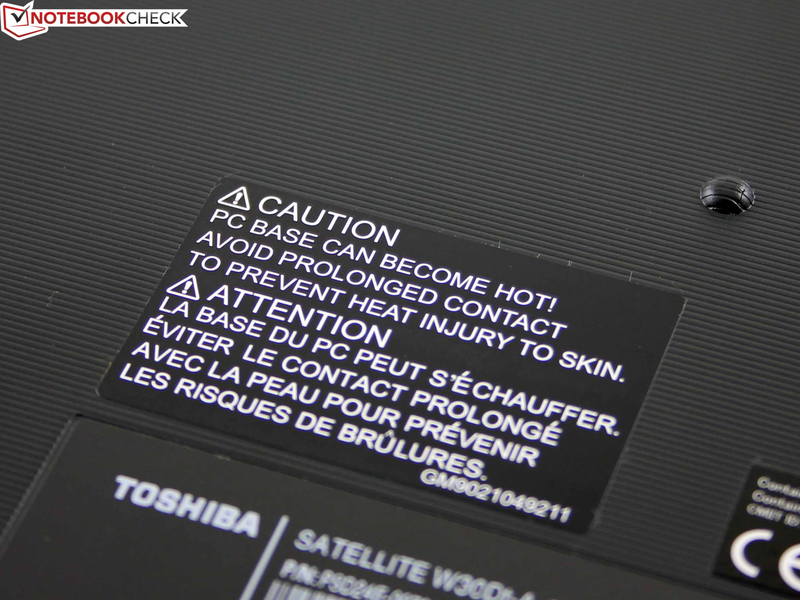 Toshiba uses an acceleration sensor in many of its notebooks, so as to prevent damage to the HDD from a fall. The user can de-/activate this feature if s/he so wishes. Toshiba System Settings is a useful tool to access and check a variety of hardware and software settings. 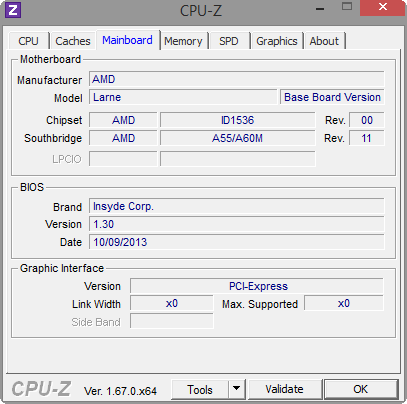 For example, the user can check the boot order with this tool without entering the BIOS. The other settings control the function keys, the USB 3.0 and SATA controllers. Maintenance is not possible as there are no access panels or even screws for that matter. The 2.5-inch HDD must be secured internally and can be theoretically swapped out for an SSD. However, to swap it out, we would probably require a 5 mm model like our HDD. We do not know if the RAM is soldered on-board or if it is removable. 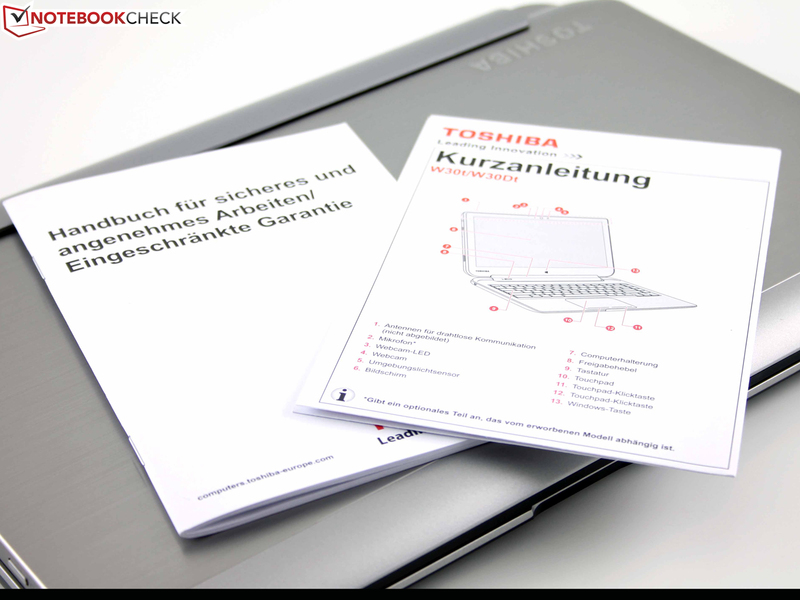 Toshiba offers a two-year warranty (Pick up & Return). The keyboard of the docking station has a well-spaced layout with the cursor keys separated slightly from the rest of the keys. Sadly, the keys are smooth and flat, meaning that they offer shallow feedback. 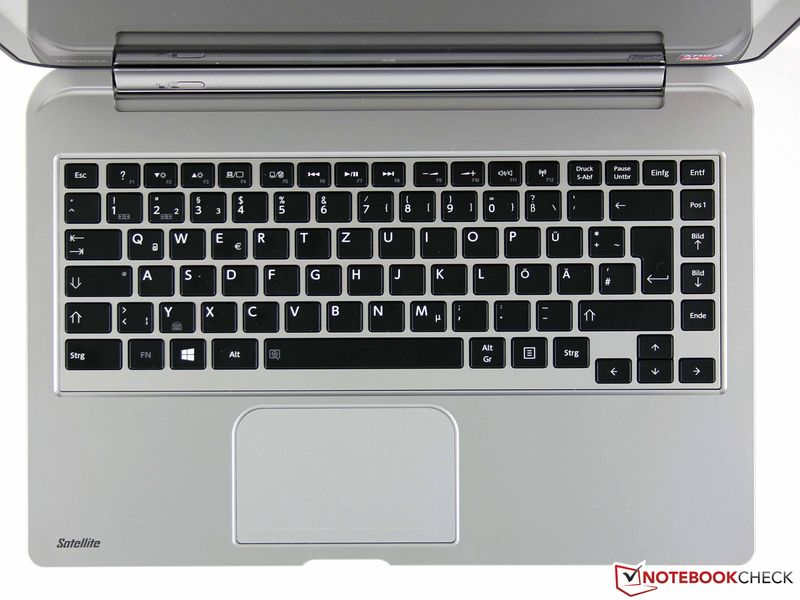 On the right side, typing can push the keyboard inwards. The left side of the keyboard is more resistant, but this results in a poor combination of a hard left side and a spongy right side. Furthermore, the stroke distance is relatively short (in comparison to better notebook keyboards). 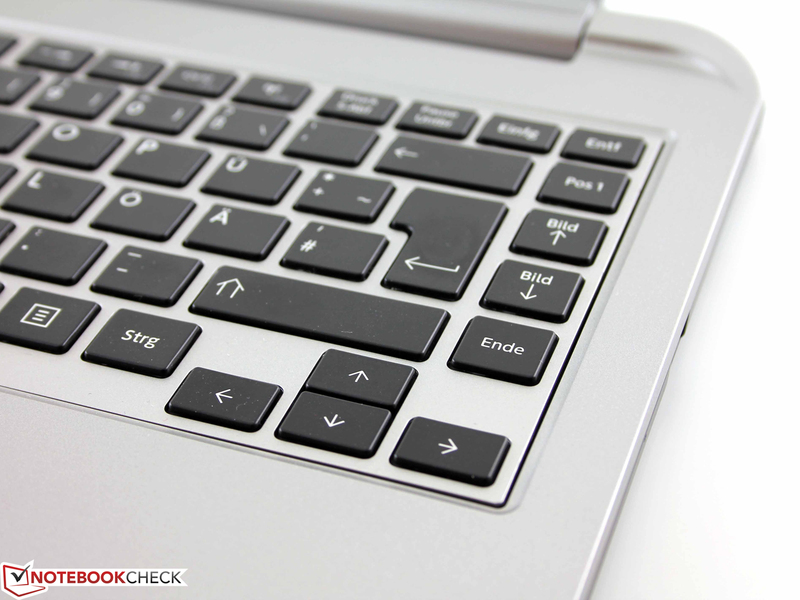 The keyboard of the Toshiba test model has the typical function keys (brightness, volume, WLAN, etc.). These can be turned on/off and the keyboard offers backlight. The latter is the only feature that sets our model apart from the Split x2, which has similarly weak feedback. 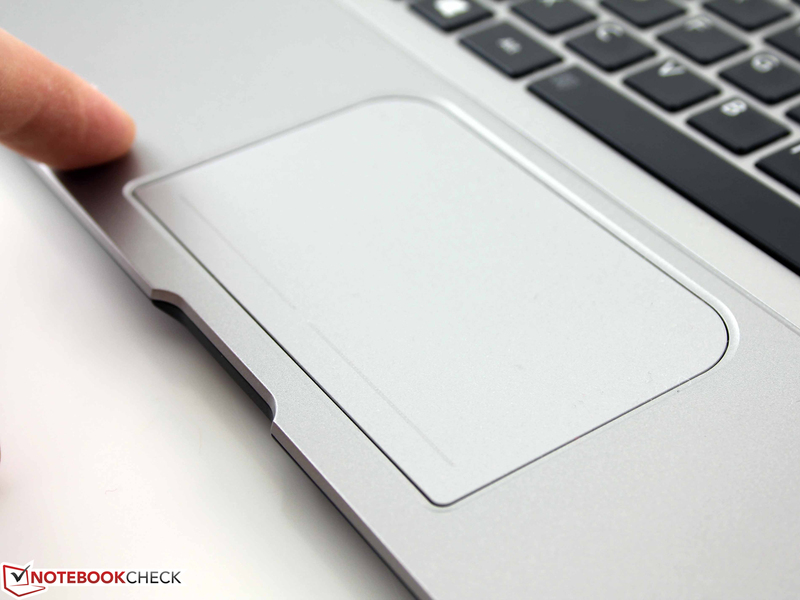 The 11.2 cm touchpad (~4.4 inches; diagonal) has no separate mouse keys. These are integrated underneath the touch surface and are distinguished by a slight hump. The pad has a clear pressure point, but a very unsatisfactory stroke distance. In our opinion, it requires too much force as the further up you press, the more pressure you need to exert. The touch-sensitive surface reacts quickly to input: our finger could almost always hit the small desktop symbols. This comfortable experience quickly degrades when the A4-1200 is at full load, as the input can no longer be quickly executed. The borders input without issues as long as the finger stays near the middle of the border (checked with Fresh Paint). Paint programs are fun to use thanks to the touch panel. The 1366x768-pixel resolution of the IPS panel from LG Display (LP133WH2 SPA1) is good. The panel uses capacitive technology, which can recognize up to ten fingers simultaneously. The brightness of the 13.3-inch panel is also quite good (for a notebook) at 308 cd/m², but for a tablet this level is below average. The HP Split x2 is much darker at 169 cd/m². Additionally, the Satellite and the HP Split x2 TFTs share one feature: the low contrast of 300:1. We did not expect this of an IPS display. The result: a black scene is not true black, but shows a gray shimmer. Colors and contrast are not as crisp or strong as they could have been with a higher contrast. This makes the Transformer Book T100TA with a 1,033:1 contrast ratio a better candidate (see table). ... and the AdobeRGB is 37% covered. We checked the color space coverage of the sRGB and AdobeRGB spectrums. The two standards are barely covered by the W30Dt but this does not affect the users of the Satellite much, as everyday use is not hindered. Overall, the test model has similar display quality to that of the HP Split x2 (see table). The CalMAN measurement with photo spectrometer shows that the test model has good colors. The low DeltaE score of 4 (in gray levels and colors) supports this statement. However, most of the competitors are on par with our test model or even better. 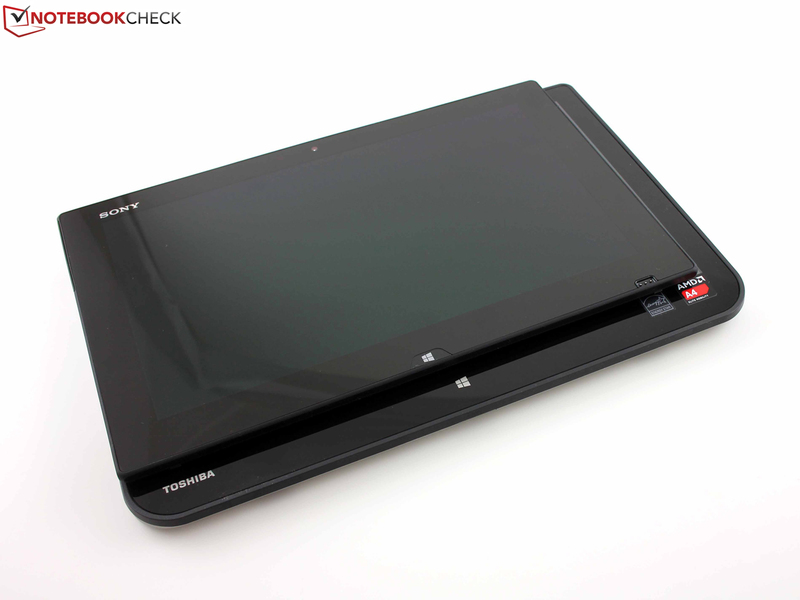 For example, the Lenovo IdeaTab Miix 10 and Miix 2 manage to score quite well in this area. We did not notice any "clouding", as the balanced illumination of 90% is not marred by white spots on any border. CalMAN ColorChecker: overall a low DeltaE score of 5. The tablet can be used outdoors as well and the ambient light sensor (next to the webcam) sets the brightness of the panel to maximum (if it is bright outdoors). The sensor can be turned off, so that the panel stays at a constant 309 cd/m² in the middle of the screen. This was the setting we used for our outdoor photos. Clouded: higher contrast would have meant stronger colors. When clouded: reflections are constant companions. The brightness can display the content well when it does not have to compete with multiple reflections. The viewing angles meet the high IPS standards. If you look from above, the display will show no color inversion. 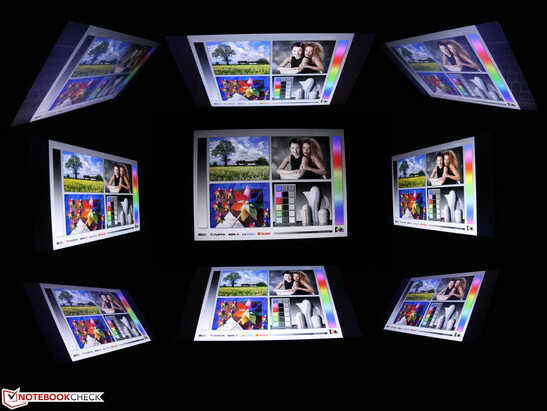 From the right or left, we can recognize content at even extreme angles (almost 90 degrees), without any distortions. 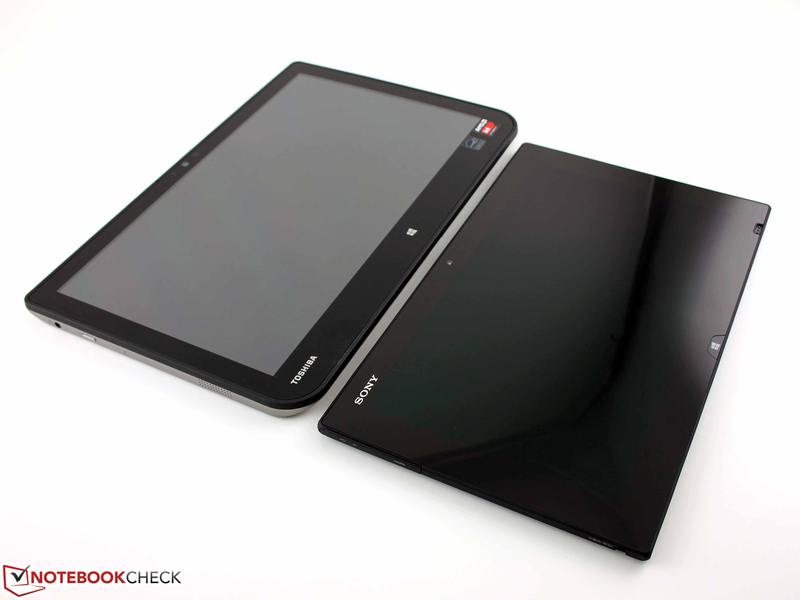 Toshiba has equipped its tablet with an AMD A4-1200 (1 GHz), a low-end APU with a TDP of 3.9 W. This is the AMD competitor to Intel's Clovertrail Atom for tablets. The talk of "Top Performance" is quite cheeky - more information in the processor section. The APU with the Radeon HD 8180 iGPU works with 4,096 MB of RAM (DDR3L), which operates in single-channel mode. The storage space of 500 GB is quite generous. 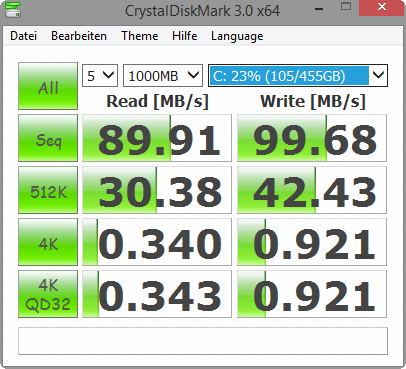 Sadly, it is achieved by using a standard HDD and not a faster SSD. 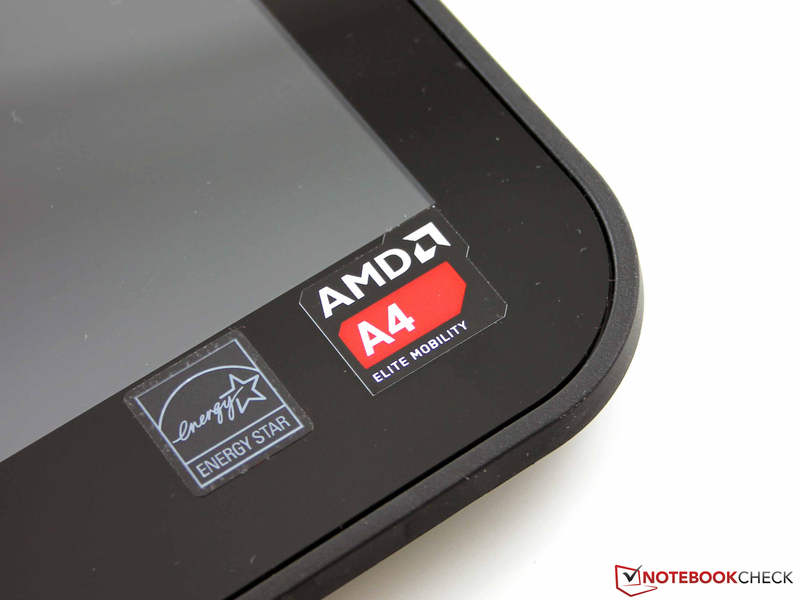 We previously tested this APU in the MSI W20-A421 and the Medion Akoya E1317T. The two processor cores are very weak without Turbo in the MSI W20 (throttled to 600 MHz) and just weak in the Akoya E1317T. The test model APU performs at the level of the Akoya and is overall close to a Clovertrail Atom (dual-core). The new quad-core Atom based on the Bay Trail platform (+82%) is far ahead of the A4-1200 in all CPU benchmarks. 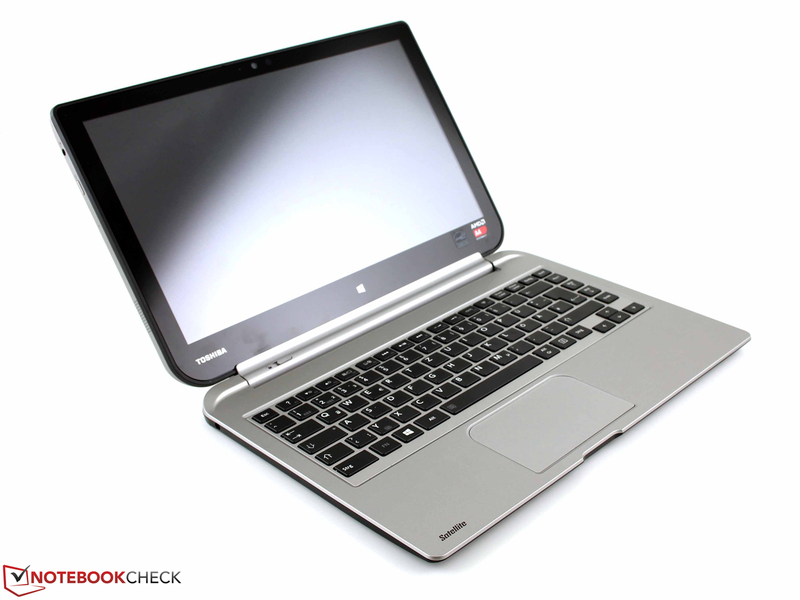 The Transformer Book T100TA is also passively cooled. 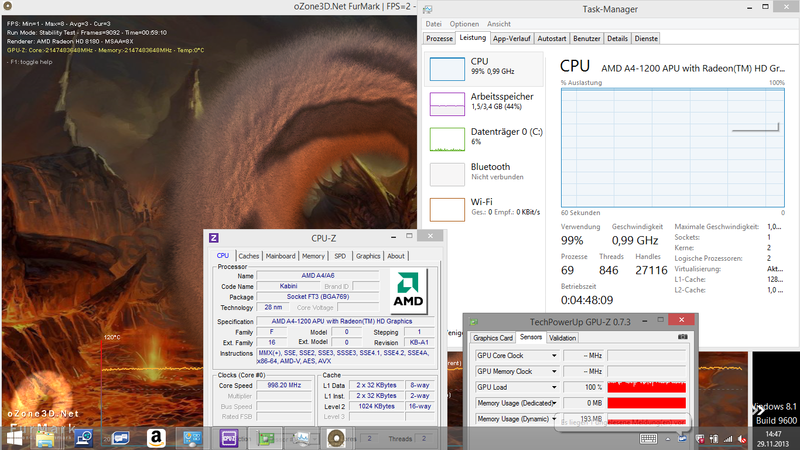 AMD also offers a quad-core APU (A6-1450, V5-122), but the TDP is far too high for tablets (8-15 W, Turbo). 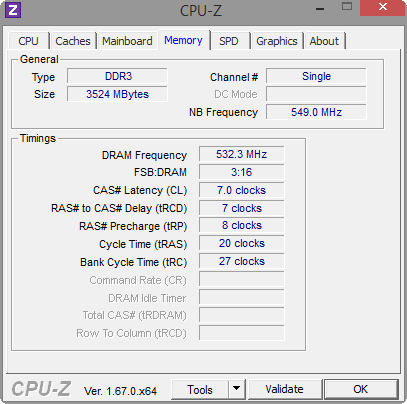 The clock speeds are the same as those specified. 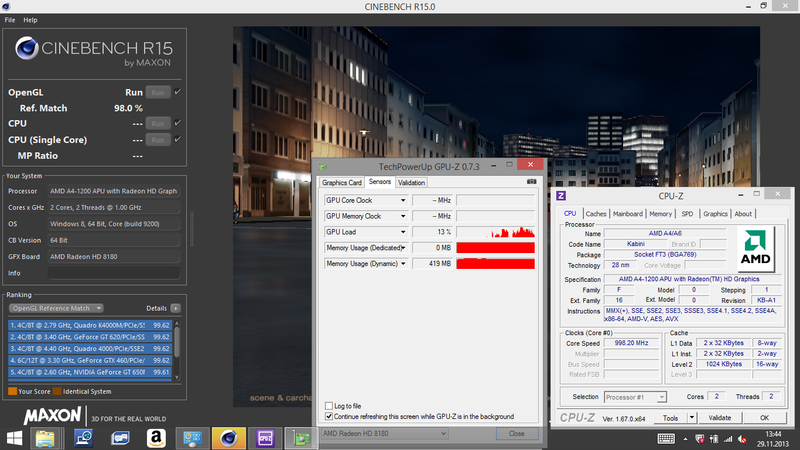 In Cinebench R15 Multi, the cores operate at a constant 1.0 GHz. The OpenGL tests with the HD 8180 have the IGP running at 225 MHz (iGPU). On battery, the performance remains identical: we ran the Cinebench R15 for this test (CPU and iGPU). The program benchmarks allow us to rank our test model amongst the Windows devices. The rotating HDD lacks the speed of a modern SSD, which can even be found in low-cost modules (eMMC in Miix 10). 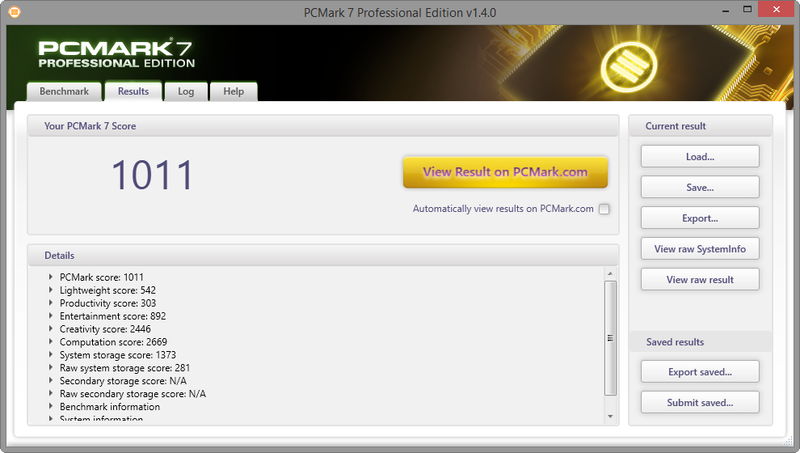 The PCMark 7 scores are about 26% lower than those of the competitors. 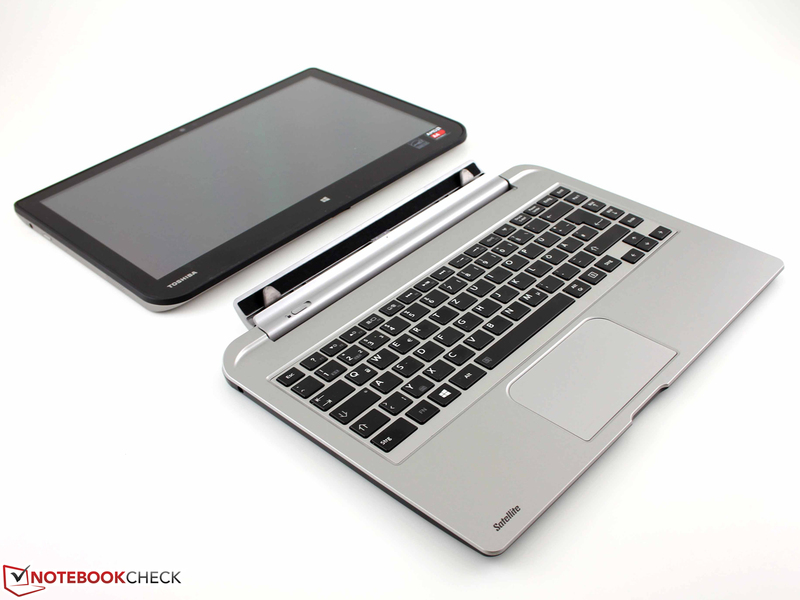 All others can score quite high, especially the HP Split x2 with its Micron RealSSD C400. More information can be found in the storage device section. Now putting aside benchmarks, how do we feel about the system experience? As long as the APU is not simultaneously running multiple tasks, it can run the W30Dt smoothly. However, when it is at high load (a virus scan, copying files or an installation), the tables turn, switching between open windows or inputting commands are heavily slowed down. Overall, we felt the experience was quite close to that of a Clovertrail Atom and far lower than that of a Bay Trail Atom. The results of PCMark 7 support his assertion (see computation scores). The IdeaTab Miix 10 (+23%), the Transformer Book T100TA (+93%) and the HP Split x2 with its Core i3-3229Y (+300%) beat our test model by wide margins. The WD Blue UltraSlim (WD5000MPCK) has a total storage capacity of 500 GB and is a new model with a 5 mm thickness. 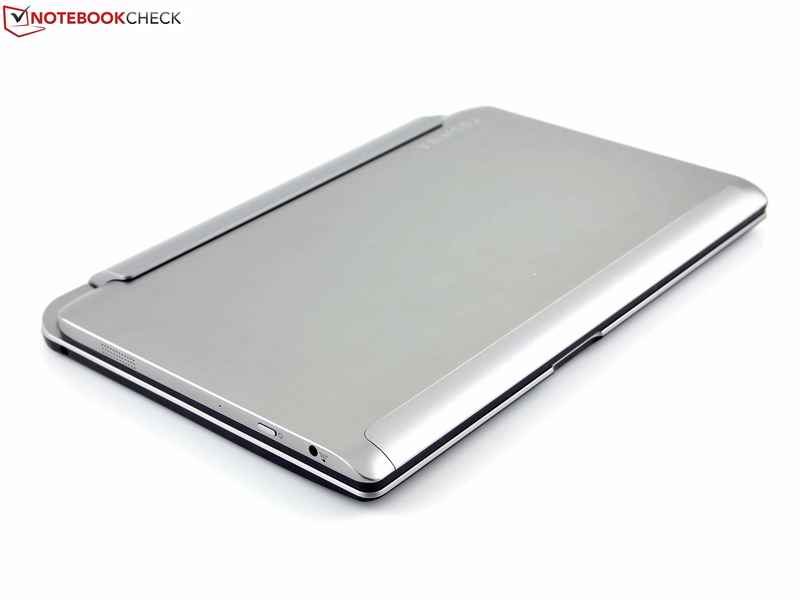 Typical 2.5-inch HDDs measure 7 mm and thicker laptops can even use up to 9.5 mm. 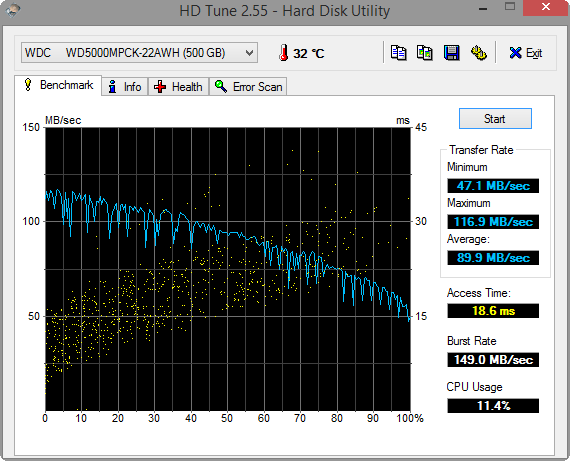 The HDD performs well, but only in comparison to other models with HDDs, like the Acer Aspire V5-122P (-8 %). The competitors, Transformer Book and Split x2, are much faster. The Split x2 is much faster as well, thanks to its great read 4K speed of 23 MB/s. 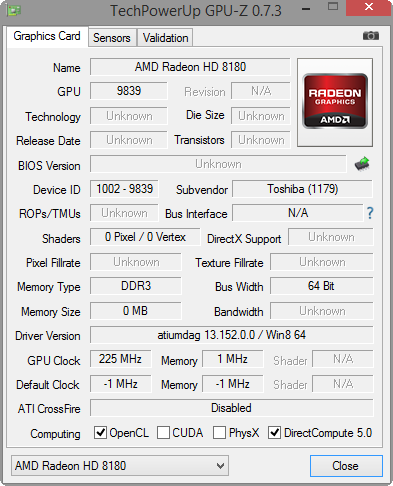 The Radeon HD 8180 IGP operates at 225 MHz and supports DirectX 11.1. 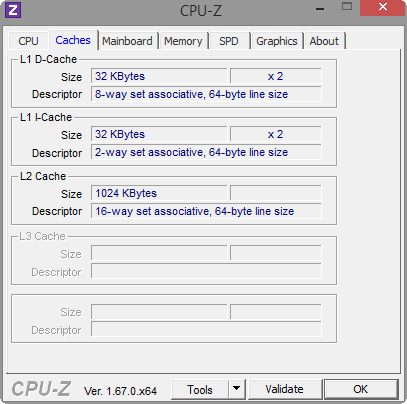 The video decoder spares the CPU a lot of work when playing high-resolution movies. For the first time, the W30Dt can stand its ground in the face of the competition: the classic 3D benchmark 3DMark 06 is 76% better than the Clovertrail competitors (IdeaTab Miix 10). 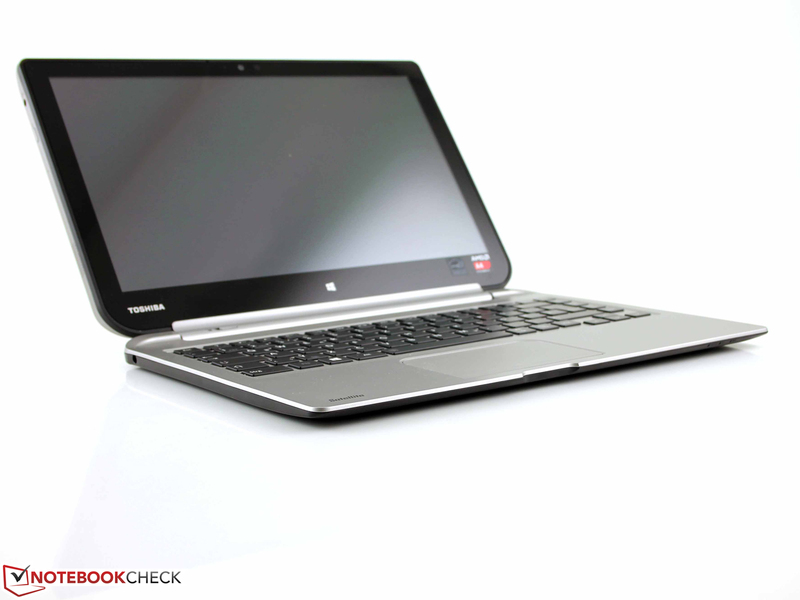 Even the Transformer Book can beat our Toshiba model, but by a small margin (5%). The HD Graphics of the Split x2 (+84%, also Single Channel RAM) make everything much better. Games designed for desktop PCs or notebooks are a big hurdle for the W30Dt - the frame rates are far too low. However, games designed for tablets are much better for our test model. 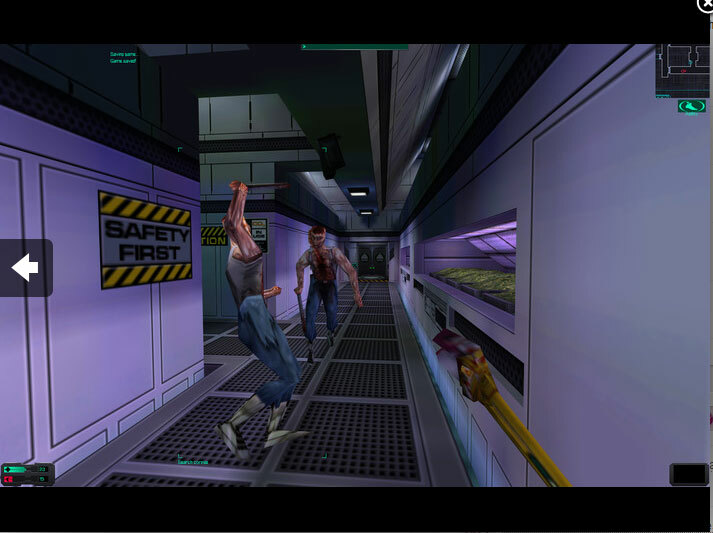 We took our readers’ recommendations and tested System Shock II (DRM free for $2-$5). This classic may not look amazing, but it plays smoothly at 59 fps (@1366x 768). 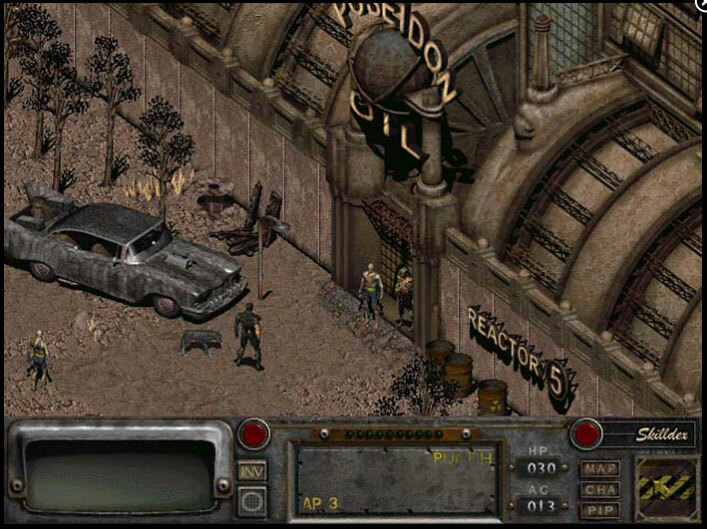 Fallout 2 was also a joy to run on the test model. Windows tablets have active cooling systems, unlike ARM SoC-based tablets. 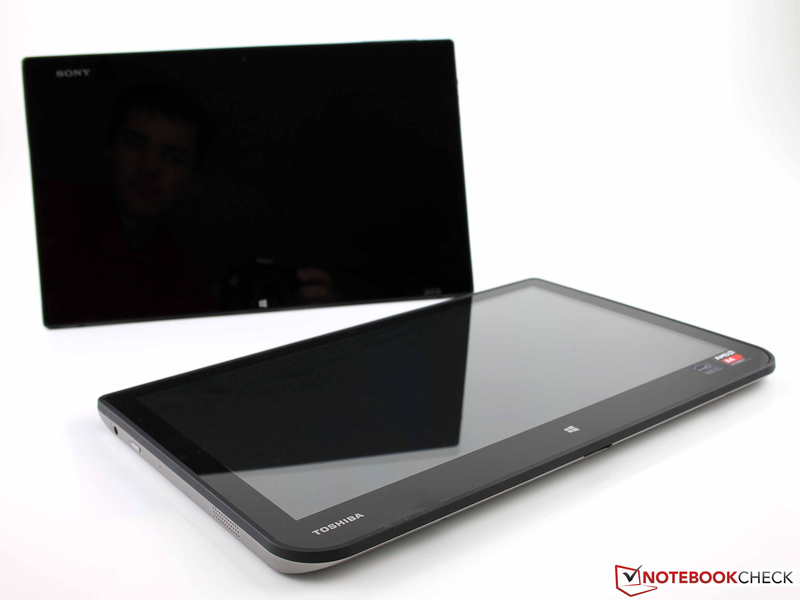 The Cloverview and Bay Trail tablets (Asus T100TA) are exceptions to the rule. The competitor, HP Split x2, requires a fan as its Core i3-3229Y has a TDP of 13 W.
The W30Dt is fanless but it is not completely silent due to the HDD. It is not disturbing as it can only be heard if the user places his ear against the device and our measurement device could not measure it (ambient noise: 29.6 dB(A)). This remains the case even when writing or reading from the storage device. This single-plate HDD emits no audible clacks. The emissions of the W30Dt remain in the green region, which is thanks mainly to the heavy chassis that effectively absorbs and distributes a lot of the heat. At load, the hotspot reaches a mere 37 °C (98.6 °F) and on the back 36 °C (96.8 °F). 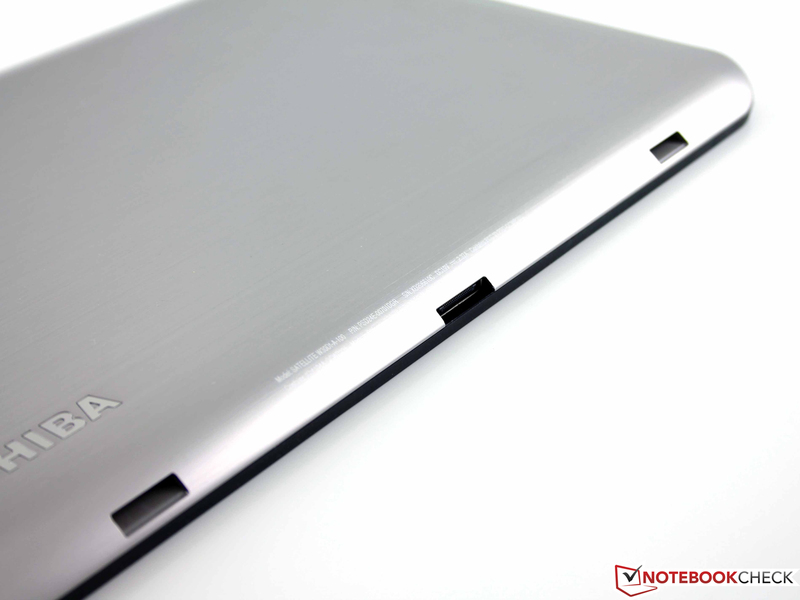 In this case, even the IdeaTab Miix (Cloverview) heats up more, as it employs a smaller 10-inch chassis. The HP Split x2 heats up 20% more as it has much higher performance, and its hotspots (top and bottom) can reach up to 46 °C (114.8 °F), although an active fan can emit up to 40 dB(A). 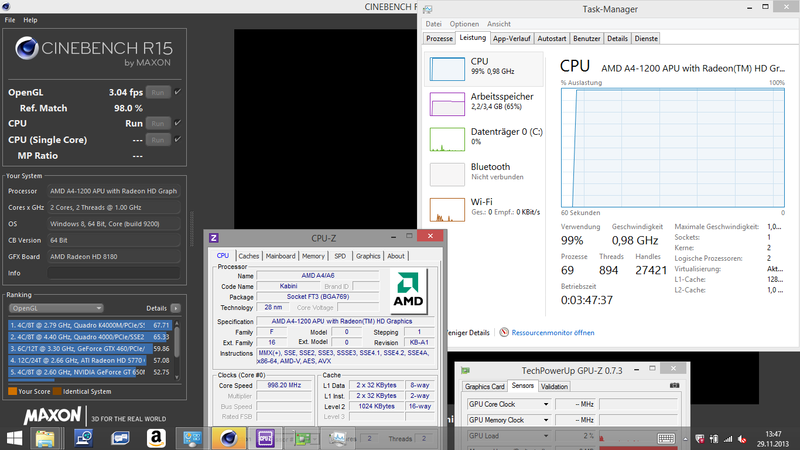 The stress test reveals that the APU continues to operate at a constant 1.0 GHz even after an hour of testing. This is to be expected, as the core has no Turbo. The GPU clock speed cannot be measured, but the GPU load was recorded at near 100% throughout with a clock speed of 225 MHz (standard). Toshiba has installed four speakers: two in the tablet and two in the dock. The latter are very clear when chatting, but are not suited for music: too much reverberation and too little differentiation between the highs and lows. Unfortunately, we could not use all four speakers simultaneously. The tablet speakers remain inactive when docked. They sound a little better than those on the bottom of the dock and the emphasis is on the middle notes as is typical for tablet speakers. The max volume is quite high and it does not distort. We found the preset audio driver settings quite poor and recommend customization. The microphone (front, laptop mode) can record audio clearly at a distance of 40 cm (~15.7 inches) but the recording was marred by an infrequent clacking. As we do not have a coffee machine in the office, we believe this to be the fault of the read/write heads on the HDD. The power consumption of the W30Dt runs between 6 - 12 W while idle, which is quite high. The 10-inch Atom tablets, Miix 10 and T100TA, require 50 - 60% less power. At load, we measured unusually high power consumption: 17 - 19 W. The Atom tablets require 7 - 12 W (dual-core/quad-core). The batteries were not charged during the test. The small power adapter delivers up to 45 W, which is enough to charge the device while running the stress test. While charging, the model consumes 6.5 W (in standby). First, the tablet battery is charged and then the dock battery. 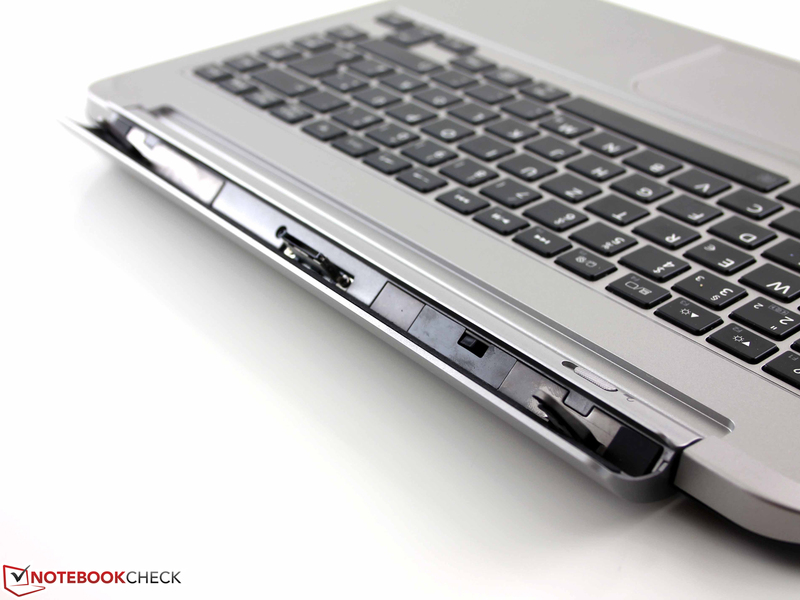 While discharging, the opposite occurs: the dock battery discharges before the tablet battery. The two batteries deplete at different times. 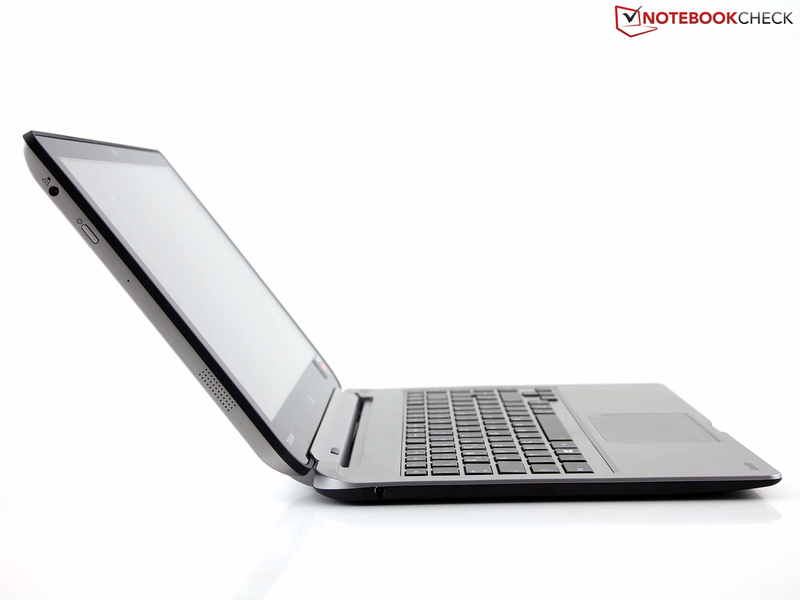 The battery life of the Satellite W30Dt is quite good: 7 - 11 hours are possible in laptop mode. 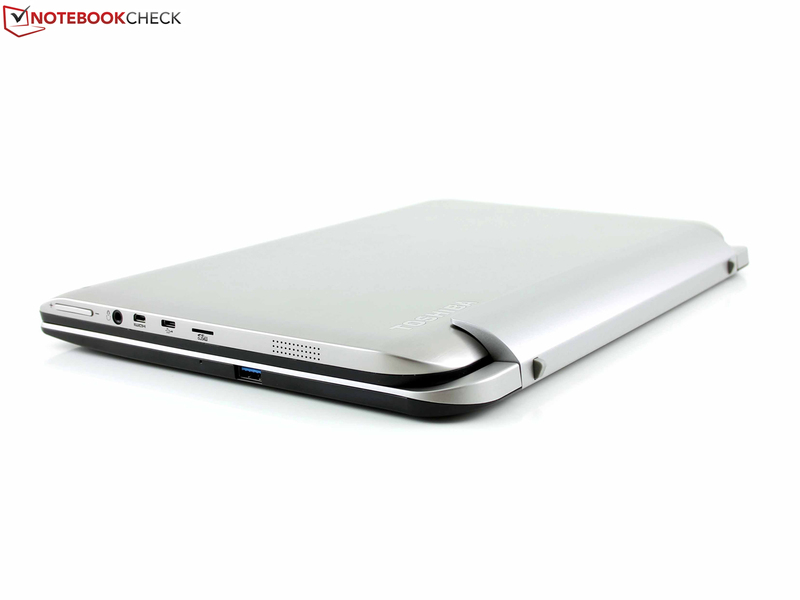 Below the keys, we have a 23 Wh battery, which is the same model as the one in the tablet. 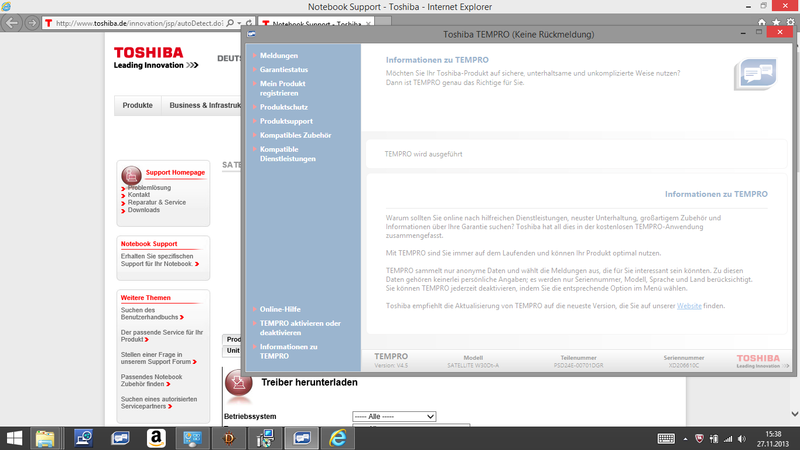 Toshiba promises up to 6:45 hours, which we easily trumped in the WLAN test: 7:10 hours. In this test, websites are loaded at a 45-second interval, sometimes with videos. The small IdeaTab Miix 10 (-23%) and the similarly-sized Split x2 (-16%) have shorter battery lives. However, considering the higher performance of the Split x2, its battery life is quite amazing. It is no surprise: the 33 Wh + 32 Wh (in dock) do a good job. Toshiba has bitten off more than it can chew. The ads claiming that the new W30Dt is a "High-Performance tablet" with "true Power" and "Top Performance" have no basis. A quick look at the hardware performance reveals that the A4-1200 of our test model is at the level of an Intel Cloverview Atom. The new quad-core Bay Trail is far more powerful in terms of performance per Watt. As such, this model is suited for users who are willing to accept the bad with the good: if they can, then watching movies, playing online games, or writing mails are all comfortably possible on the W30Dt. Older games, which have been released as DRM and often cost less than 5 Euros (~$7), should run without issues. The Satellite W30Dt may have issues, but it is not a bad device. It does not claim to be a slim model and its solid chassis will allow it to withstand quite a bit of abuse, especially at the hands of excited children. 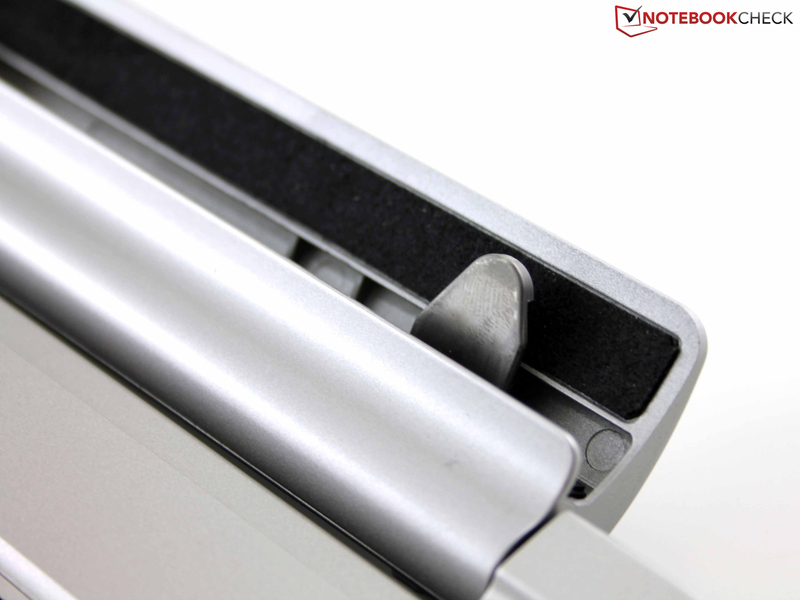 The heavy display hinge and the pressure resistant aluminum cover are further pros of the model. The ports on the device are quite good and offer good connectivity. 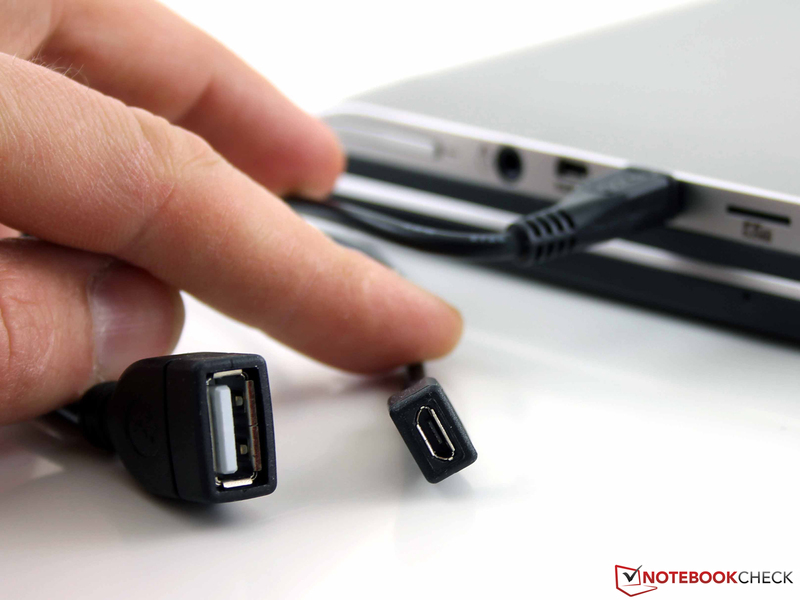 USB 3.0 is provided on the docking keyboard and the tablet houses USB 2.0 and HDMI. The 500 GB HDD will be useful and it is protected by a fall sensor. The input devices are far from perfect: they (especially the keyboard) lack clear feedback. The same applies to the display, which may be an IPS panel, but the contrast is modest at best. Competitors do not exist at this price (669 Euros; ~$955) in the 13.3-inch format. We took a look at the stronger HP Split x2 (13-inch, roughly 900 Euros; ~$1230) and the Transformer Book T100TA-C1-GR (10-inch, 470 Euros; ~$642 with a 500 GB HDD in the dock). 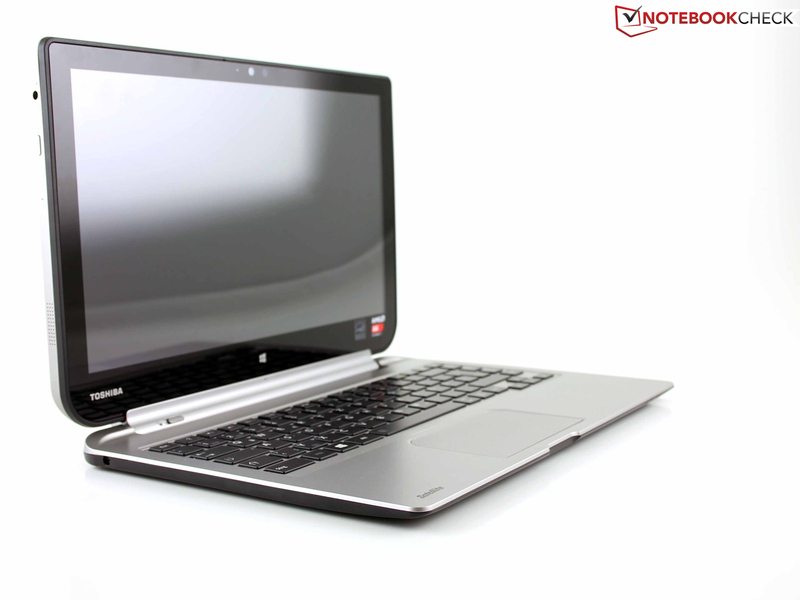 The Split x2 is suited for those users who want the performance of a subnotebook and want to do more than watch movies, write mails and play old games. The Transformer Book is also quite fast and offers a docking keyboard. Its Intel Atom Z3740 is fast and is more efficient than the A4-1200 APU of our Satellite W30Dt. 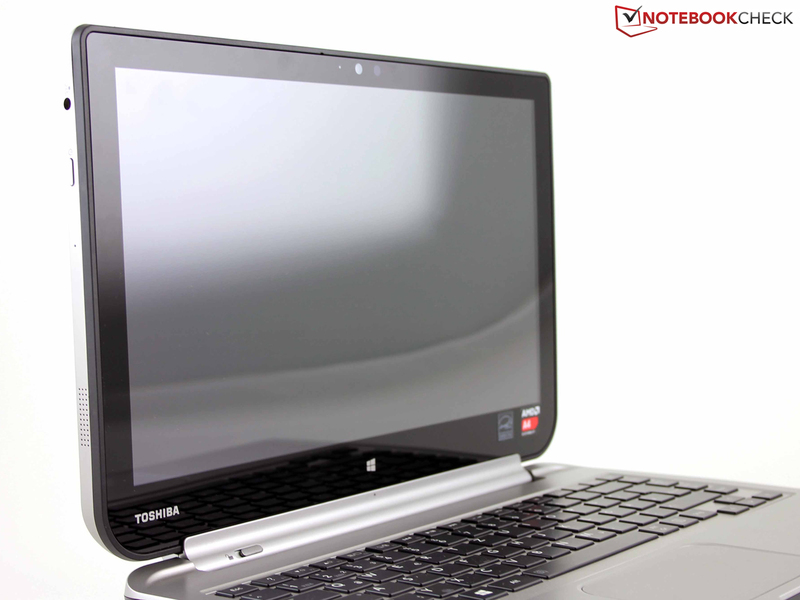 Toshiba Satellite W30Dt-A-100:a slow Windows 8 experience, but still a good package for working at home. 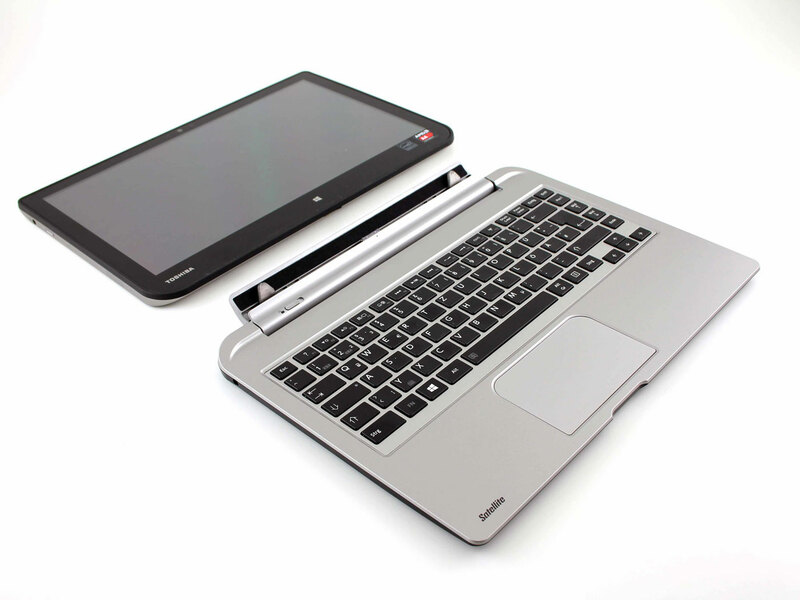 "The Satellite W30Dt-A is a high-performance tablet which can be quickly converted into a fully-equipped notebook." A big statement from Toshiba. 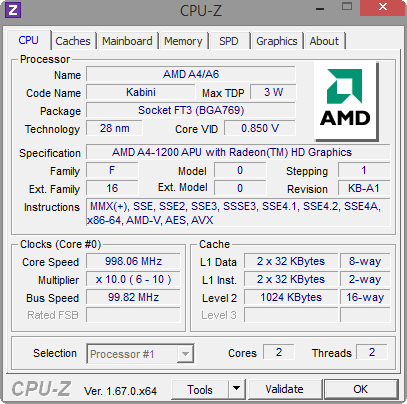 AMDs weakest APU is a conservative processor. The overall performance is decent for a netbook and at the level of an Intel Atom. ... a 2.5 inch 500 GB HDD rotates behind the panel. The HDD is sensitive and is the single source of noise emissions from the W30Dt. Push the lever and the tablet can be taken out. The 13-inch panel can then be used to watch a film in the bed. 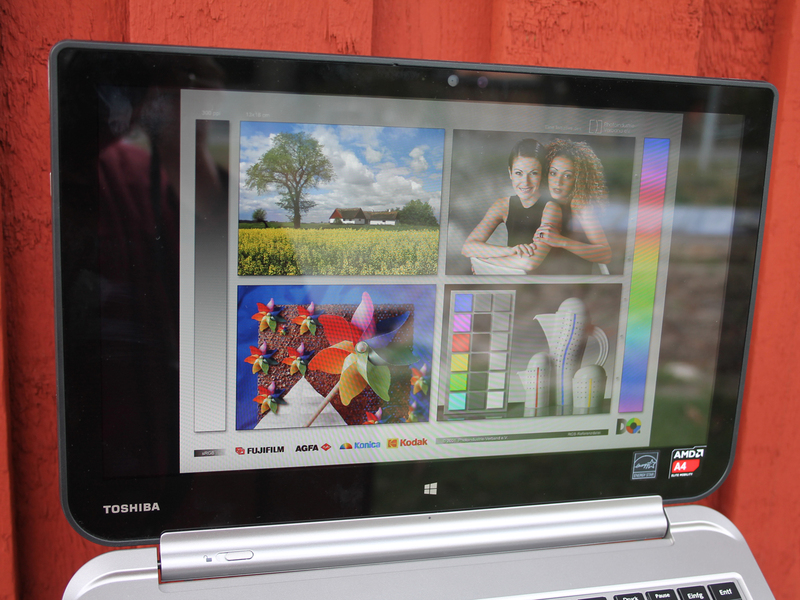 The W30Dt is a giant at 13.3 inches amongst the Windows 8 devices. Sonys Vaio Tap 11 is a 11.6-inch tablet. This is the comparison picture with the tablet lying on top. ... holds the kilogram-heavy tablet in position. The hooks are well-built and promise longevity. A second battery rests beneath the keys. Its weight prevents the tablet from tipping over in laptop mode. The chassis is made of a reliable aluminum panel. The area around the keys is made of sturdy synthetic material. Bad: the tablet wobbles significantly in its dock. 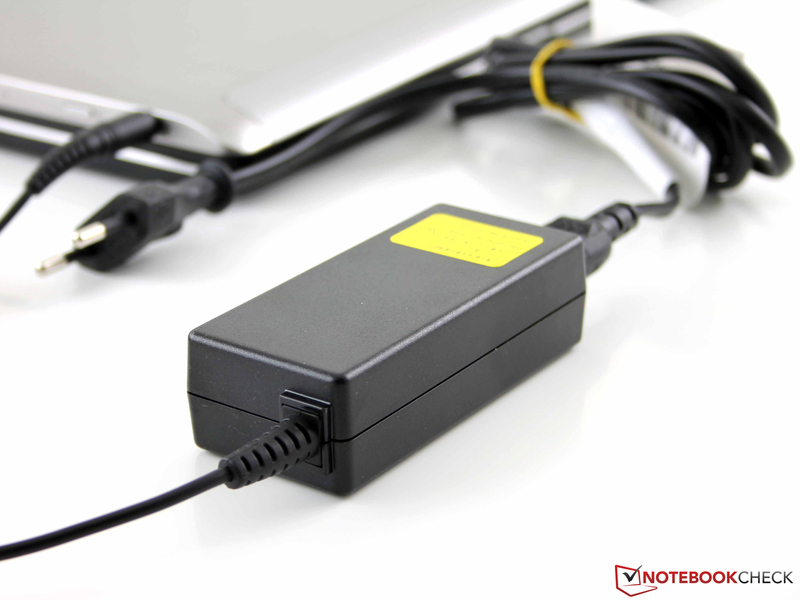 The small power adapter offers 45 W.
More than enough as even at full load, the W30Dt requires a mere 19 W.
Together the tablet and base weigh more than 2 kilograms and are heavier than a few 13-inch notebooks. The Satellite W30Dt-A-100 is a notebook replacement, which offers the option of being temporarily more mobile in the form of a tablet. 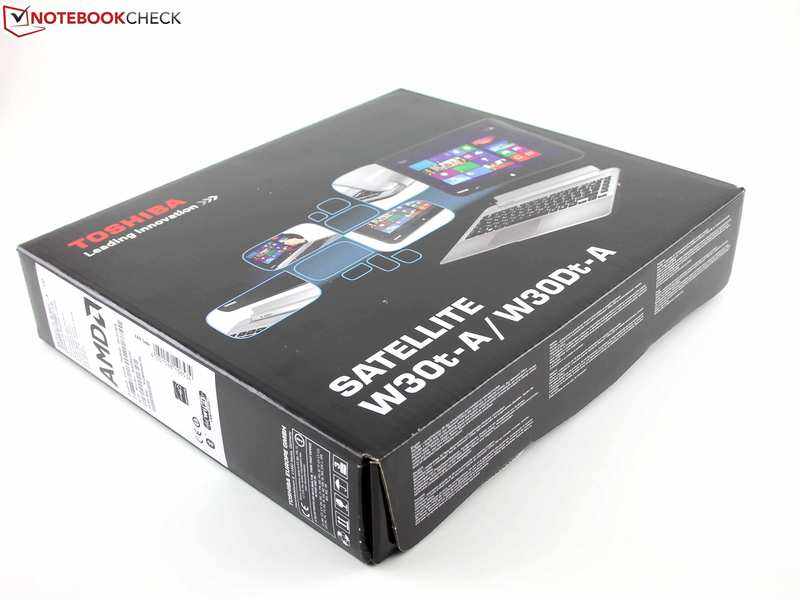 Satellite W30Dt-A-100: it is doubtful whether anyone can show with a kilogram-heavy, 13 inch tablet. Satellite W30Dt-A-100: the device is a good work machine for easy work at the office or home. 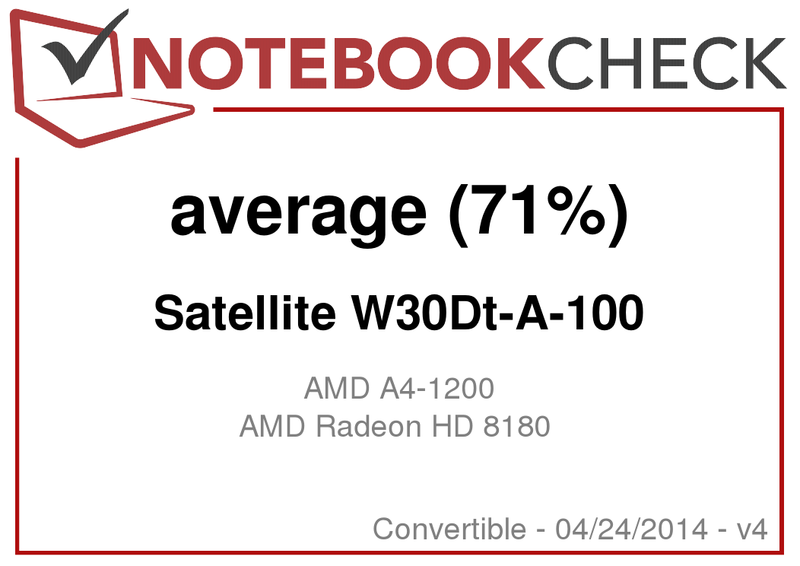 Satellite W30Dt-A-100: The AMD APU combined with a slow HDD can only offer so much. Sadly, this configuration will quickly become obsolete in the future. Satellite W30Dt-A-100: a good IPS display. 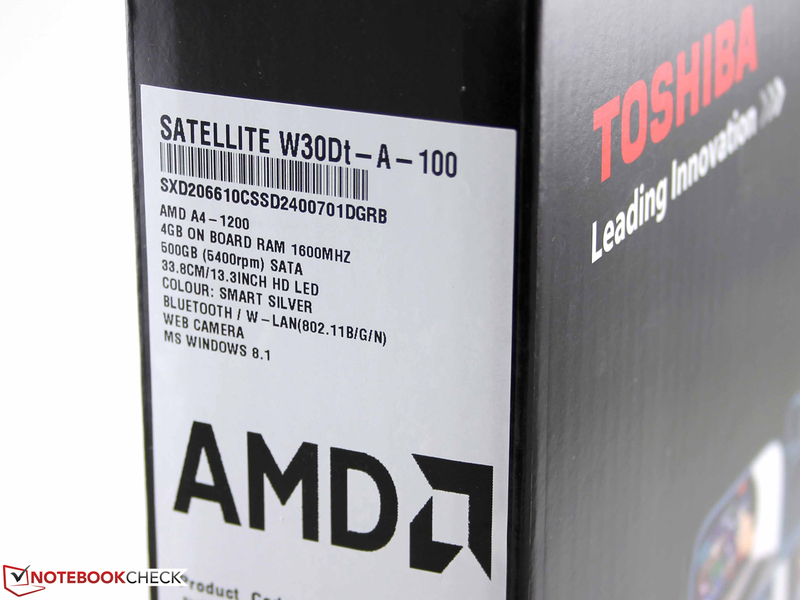 Satellite W30Dt-A-100: AMDs low-cost APU is not the best choice for Windows users. The solid, if thick and heavy, build of the tablet. The only 13-inch convertible available for less than 700 Euros (~$957). A keyboard with better feedback. A higher contrast, if only so that we can enjoy our movies, pictures and videos. Tuners and tweakers would have enjoyed access to the innards of the model. The HDD can be swapped out, but probably only for another 5 mm model. If you believe Toshibas exaggerated description, you will be very disappointed by the performance of the tablet. Intels Bay-Trail-Atom is cheaper in similar devices and far more powerful. As such, we see no reason to recommend an A4-1200.